Great Yarmouth Racecourse Conferences at Great Yarmouth Racecourse01493 842527work Conference non-residential venueGreat Yarmouth Racecourse Conference Centre is a unique and versatile conference venue suitable for a range of meetings from 'one to one' sessions, to lectures, training days and full day conferences for up to 380 delegates. With stunning views over the racetrack and out to sea, the recently built Lord Nelson Grandstand has nine suites suitable for meetings in theatre or boardroom style suitable for 15 - 24, eight of which have private balconies. Our large suite suite at the rear of the stand has lovely views out over the lawns and is suitable for meetings for up to 50 people. We have three larger rooms overlooking the racecourse which can be combined to accommodate a maximum of 380 people in a theatre style layout. Our smaller suites are perfect for use as break out rooms. In the centre of the racecourse, our Centre Course Suites offer additional meeting space in a range of suites for between 10 - 40 delgates. Great Yarmouth Racecourse also has 650sq m of space for exhibitions. Catering - From reception drinks to five course banquets, our superb caterers can provide tailor made menu packages to complement your function. Event Services - We offer a range of production and presentation services and equipment – everything you need to enhance and facilitate your event. Disabled Facilities - Fully committed to equal opportunities, we have excellent facilities for visitors with disabilities, including toilets, lifts and convenient vehicular access. Great Yarmouth Racecourse Conference Centre is a unique and versatile conference venue suitable for a range of meetings from 'one to one' sessions, to lectures, training days and full day conferences for up to 380 delegates. Personnel - We have an extensive database of professional people, including stewards, consultants, entertainers and contractors, all dedicated to ensuring your event’s success. Open for use as a conference and meeting centre all year round. 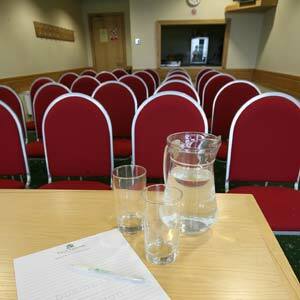 Please contact our commercial team to discuss your conference, meeting or function and obtain a personalised quote.